We now issue an annual Membership & SOS (Support Our Sponsors) card to each of our members and this provides proof of your membership for 2019. 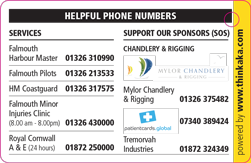 The card is sponsored generously by two local Companies, Mylor Chandlery and Rigging and Patient Cards Global. We hope to develop further benefits with the card – please check the website regularly for updates and news. Please mention that you are members of FSC when using any of our sponsors’ services. All of the Club sponsors support our efforts to maintain our high-quality racing and friendly Club atmosphere.